Play in the Sand While Helping the Lake! Want to help save the Lake while you play in the sand? The Upper Saranac Foundation is looking for volunteers to assist in surveying the Lake for the invasive, Asian Clam. This is a great opportunity for friends and families to get together to help our Lake and have fun in the water. Volunteers will be asked to use sieves provided by the USF, to sieve through shallow, sandy areas of the Lake looking for Asian Clams. What is an Asian Clam you ask? 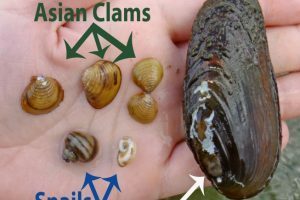 Asian Clams are an invasive clam that can grow and spread rapidly, degrading water quality by feeding plant and algal growth. 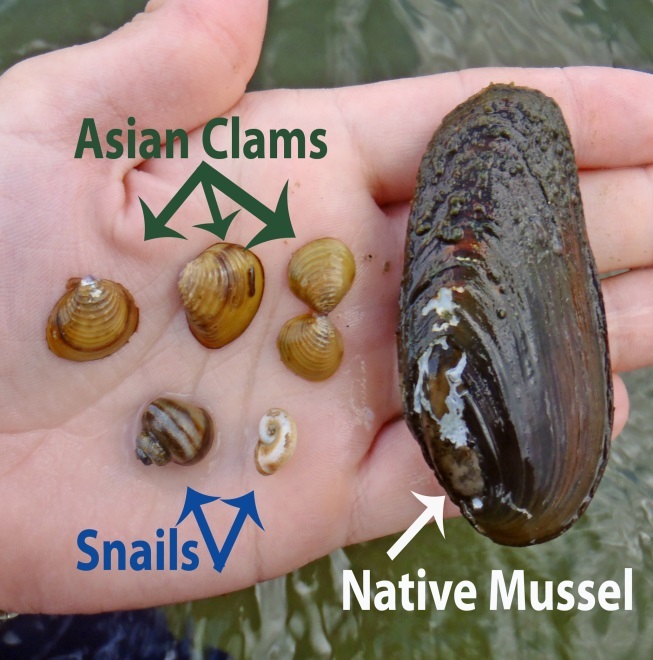 Concentrations of Asian Clams have the potential to cause damage to the environment, negatively impact the tourism economy, reduce property values, obstruct water pipes for drinking water, and cause lacerations in swim areas. We are asking people to join us in the Asian Clam Survey effort by taking sediment samples from sandy, shallow areas near shore at predetermined locations. Volunteers of two or more can perform the survey at their leisure any time in August (the most opportune time to find the Clams). Depending on the size of the volunteer group, and the size of the sample site chosen, the survey shouldn’t take much more than an hour or two. Can you think of a better way to enjoy a warm summer day while giving back to the Lake? Volunteers will be instructed in what to look for, how to look and what to do at the conclusion of the Survey. Although we hope that Asian Clams are not in existence in the Lake, this inaugural survey effort will determine if they are present. Early detection of the Clam is imperative for eradication. 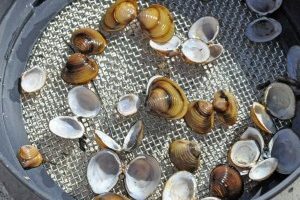 Late discovery of Asian Clams in Lake George has resulted in expenditures over $1.5 million in efforts to eradicate the Clams. In the unfortunate circumstance that Asian Clams are introduced to Upper Saranac Lake, we want to find out as soon as possible, to assure eradication and avoid such a cost. Asian Clams are not native to the United States and were brought here as an unwelcomed import. Since then, they have spread through the bait and aquarium trade. Juveniles can be moved around in bait buckets and other areas of a boat that hold water. 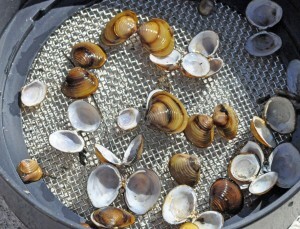 As with all invasive species, Asian Clams do not have any local competitors that will keep their population in check. A single Clam can self-fertilize, can reproduce up to twice a year and can produce 2,000 – 4,000 juveniles per year. Densities can reach up to 6,000 or more clams per square meter. Find a friend, or better yet, a group of friends that are willing to help, and simply sign up with me, the Volunteer Asian Clam Survey Coordinator, Guy Middleton. I will help you choose one of the predetermined survey sites that best fits you. Prior to when you want to do the Survey, you will need to pick up your Survey kit which will include instructions and as many sieves as you will need for your group. Then, all you need to do is secure a boat to access the site, put on a bathing suit, sun screen and have fun in the sand. Contact with Asian Clams presents no health hazard risk to the surveyor. 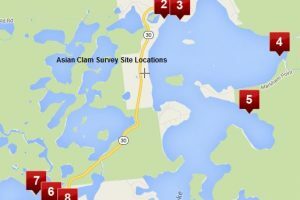 If you are unable to participate in the Survey, you can still help stop the spread of Asian Clams, and other invasive species, by washing your boat and all equipment before entering Upper Saranac Lake. Be sure to drain all water, including live wells and bait buckets, and dry anything that has come in contact with previous water sources. 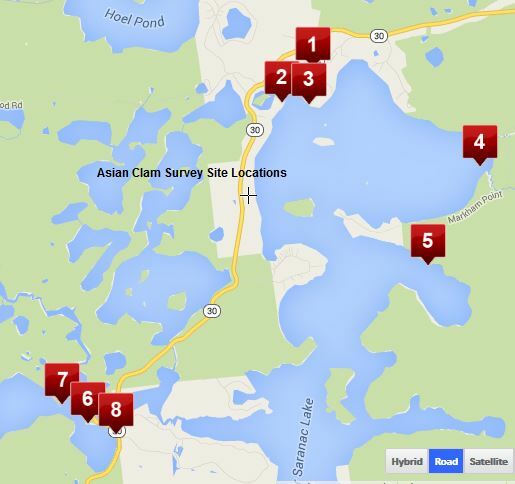 For further information about the Asian Clam Survey or better yet, to volunteer and pick up your survey kit, contact Guy Middleton, Upper Saranac Foundation Lake Manager and Volunteer Asian Clam Survey Coordinator, at email or 518 796-1052.